LXXIII, 595 p., 17,3 x 24,8 cm. The continuation of the lawsuit regarding the ›Augenspiegel‹ was the ever present background for the 90 letters in this volume. When Reuchlin won his case at the episcopal court of Speyer in the spring of 1514, Cologne theologians called upon the highest judicial body for questions of faith: the Holy See in Rome. Reuchlin’s close contacts to influential cardinals of the Roman Curia such as Egidio da Viterbo, Domenico Grimani or Adriano Castellesi are documented by the correspondence during these years as are the efforts made concerning the involvement of Pope Leo X himself. The correspondence with men such as Erasmus of Rotterdam or Jacques Lefèvre d’Etaples illustrates the broad support given to Reuchlin at that time by the humanist avant-garde. The letters written by Hermann von dem Busche, Johannes Crotus Rubeanus and Ulrich von Hutten lead directly to the authors of possibly the most famous of all modern Latin satires: the ›Epistolae obscurorum virorum‹, published anonymously in two parts in 1515 and 1517. 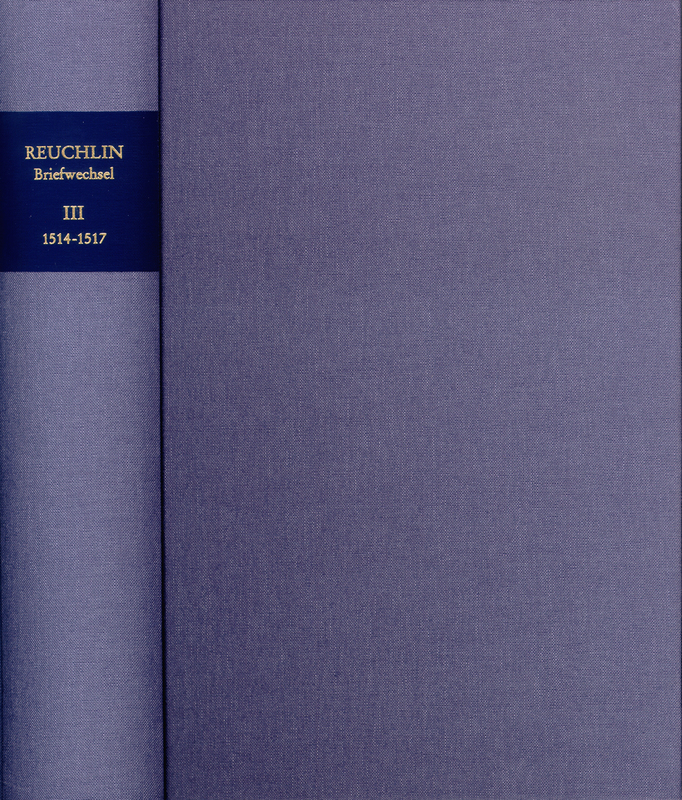 This edition has to be noticed in every scholarly work on Johannes Reuchlin and his context. This volume is another superb example of German scholarship of a critical edition of correspondence in Latin, Greek, and Hebrew. [...] The correspondence is introduced by an excellent overview of the historical context. Wie schon in den vorausgegangenen Bänden sind die Briefe mit einem umfassenden Kommentar ausgestattet, der schlechthin keine Wünsche öffen lässt. [...] Auch die umfassenden Sacherläuterungen lassen einen bei der Lektüre des Bandes regelrecht in das Netzwerk der Humanisten und ihre Zeit eintauchen. Hervorgehoben sei auch, dass der Kommentar sorgfältig die literarischen Anspielungen und Bezugnahmen auf den Reuchlin-Briefwechsel in den literarischen Verteidigungskampagnen zu Gunsten R.s aufzeigt. [...] insgesamt ein[...] große[r] Gewinn für die Humanismusforschung.